This is my very first entry for YS and this was taken by me when we had our socials last Wednesday night. It is one of the cocktail foods served at that time. Guess what? It's a boiled egg cut into half. At first I was so hesitant to taste it because it's just an egg, but when they forced me to ate it oh my! it was so yummy!! It's some kinda topped with chocolates and a sprinkled veggies. I don't know what's the exact name of this recipe, I forgot to ask the waiter. I'd like to make a version of this on my own. (LOL) Sorry, I was not able to remove the cellophane cover! Interesting food. Looks yum though. Happy Yummy Sunday! Wow! so unique......sure they tasted good! wow. this is the most interesting entry i have seen for this week so far. eggs with chocolates and veggies? cool! welcome to Yummy Sunday Phebie, glad to have you on board. Lami na sab! Hahaay! Di na nako kaya ni LOL! wow! 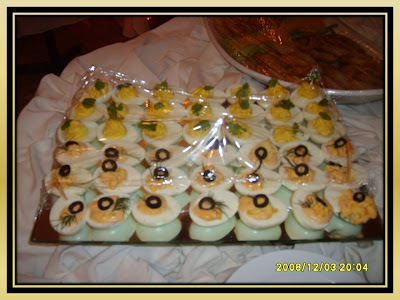 looks so yummy, I feel hungry looking those eggs.. I can't imagine how eggs with chocolate taste like..hehehe! Sunud Luv, dal-i ko ha? hehehe!